The controversy about the press conference by the four senior-most Judges of the Supreme Court recently has not fully died down and most critics have already given it a political flavour. 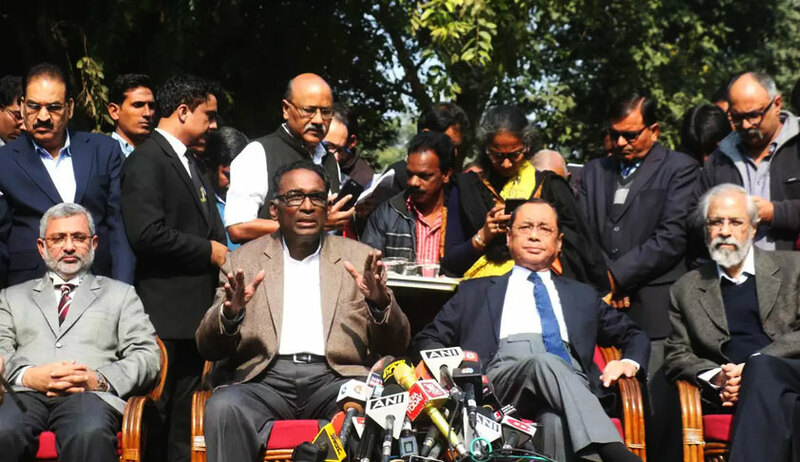 While some celebrated the revolutionary step taken by Justice Chelameswar, Justice Gogoi, Justice Lokur and Justice Kurian, there has been considerable conservativism which seems to propagate that the problems of the court must be dealt with within the four walls of the court - the “dirty linen in public” philosophy. This philosophy seems to have held the field insofar as our Supreme Court is concerned from the time it was established a near three score and eight years ago. The dignity of the institution and the image of the judiciary in the eyes of the people is paramount they say. And this seems to be one of the principal grounds for criticism of the four judges who addressed the press. The functioning of the judiciary has been for long insulated from public scrutiny, and this boat has suddenly been rocked by the presser. Most people believe that for the court to maintain its dignity in the eyes of the public, the functioning of the court must be behind closed door. Simply put, our judiciary has been functioning for long in an echo chamber, without adequate public scrutiny. And none seem particularly keen to disturb this status quo. Contrast this with the Supreme Court of the United States (SCOTUS). A little under a year ago, US President Trump nominated now Justice Neil Gorsuch to the seat vacated by the indomitable conservative Justice Antonin Scalia’s death in 2016. Subsequent to the nomination, Neil Gorsuch faced the Senate Judiciary Committee like his other predecessors and justices of the SCOTUS. At the hearings, the committee made, like always deep and incisive inquiries into his views and opinions. One is referring to the confirmation hearing of Neil Gorsuch being the most recent. The recent confirmation hearings of the other justices of the Supreme Court of the United States are available for all to see on YouTube and other social media. One need only watch some of these hearings to learn the level and extent of scrutiny that a nominee to the court faces before the Senate votes on the confirmation. Although, the appointments to the SCOTUS are political and the judiciary is deeply divided as Republican or Democrat, there is a sense of legitimacy that is brought to the confirmation hearings and the subsequent appointment of Judges. It is not unknown to the justices of the court to make public statements on issues pertaining to the interpretation of the US Constitution. The justices also speak to the print and electronic media. It is also not unknown for justices (like Scalia) to take strong stands against other opinions of other justices and the interpretation of the Constitution in controversial and path-breaking cases like Roe and Windsor. The audio recording and the transcript of arguments of cases heard by the Supreme Court are available to one and all to access on its website. In fact, Justice Ruth Bader Ginsberg has publicly supported the televising of the hearings of the Supreme Court. And there are other justices who support cameras in the courts. Some criminal trials in the United States are televised, and they are available on YouTube for all of us to see. With unrestricted free speech, the justices are often subject not only to severe criticism but also to satire and comedy. From being a taboo, televising court proceedings have become more acceptable in the United Kingdom in more recent times. Interestingly, the Supreme Federal Court of Brazil televises both the judicial and administrative meetings of the court. What is pertinent is that in none of these countries do people respect the judiciary any less than any other country. Or, for that matter, the dignity of the judiciary as an institution is in any manner compromised in the public eye. The present piece does not seek televising of court proceedings, but only raise a question that persists – why is the idea of discussion of the affairs relating to the judiciary in public treated with such contempt? Why, indeed, is the judicial organ afforded a higher insulation from the other organs of the state, when it comes to public scrutiny and criticism? There is no justifiable reason as to why the court is above the other organs of the state, and must enjoy insulation from scrutiny. There is an inherent resistance from within the system – the bar and the bench, to larger scrutiny. Sensitive to criticism, the judges have sometimes invoked the power of contempt to silence criticism. We, the people, are as much interested in the affairs of the judiciary as anybody else, and therefore, to exclude discussion/deliberation of the affairs relating to the judiciary amongst the public, in my submission, is severely detrimental to vibrant democracy as ours. The presser by the four senior judges a few days back is primarily criticised because the people have now begun to question the institution of the judiciary – the dirty linen in public philosophy. But one question which one must really address is what is this ‘institution’? Surely, the institution of the judiciary is not just the judges of the court and the members of the Bar. Surely, it includes We, the people, as an important stakeholder. And if that be so, and if there is dirty linen, then why should the people be ignorant of this dirty linen? Have the people not a right to information? For, the right to being informed is what the courts have held as a standard to be followed by the other branches of the state. The Executive and the Legislature are answerable to the people, and therefore, open to continuous public scrutiny. And the criticism by the people at large does not do much to the tarnish the authority or the image of the Executive or the Legislature. So, then why do we shy away from bringing the judiciary within the public eye? There is a great deal of debate on this topic, with no satisfactory answer. If there is dirty linen, then well, that dirty linen must be washed in the full eye of the public. For, if one is afraid of the dirty linen being washed in public, then one must make sure that there is no dirty linen. We often forget that the judges and the lawyers are not those whose rights are actually adjudicated by the courts. The people are the ultimate consumers of justice, and therefore the interests of the people, trumps any other notion of the institution. But with times, and technology, things have changed, and the judiciary has become more accepting of being more open. The collegium system has been heavily commented upon by persons who understand it – and more vehemently by those who don’t. It has even been castigated by those who have criticised it for the sake of criticism and by arm chair pundits. But the one aspect of the collegium which was erstwhile most criticised was the secrecy of its functioning – the manner in which the nation’s judges are chosen by the first five, with none else knowing why. Justice Ruma Pal famously termed it “the best kept secret in this country”. But the churn over the last three years and the continuous efforts from within the court (for example Justice Chelameswar), the collegium headed by Chief Justice Misra has made public the minutes of the collegium for one and all to see. For the first time, there has been some transparency in the system of appointment of judges and the process and not as opaque as it had been for a near two decades. This, despite the court categorically refusing to make the Right to Information Act, 2005, applicable to collegium meetings. Similarly, the judges have also made available their assets, albeit voluntarily, on the website. Most high courts have also followed suit. More recently, Justice Goel and Justice Lalit have directed the government to install CCTVs in some lower courts as a pilot project, and the experiment seems to be working just fine. This could possibly be emulated in other courts. Last week, Indira Jaising filed a petition for the livestreaming of important cases in the Supreme Court – how the court deals with it is for us to wait and watch. But imagine how it would be if we had to us available at least the transcripts or audio recordings of landmark cases like Kesavananda Bharati or Maneka Gandhi in the 1970s. Imagine what a treasure trove of scholarship it would be. Imagine being first hand witnesses to those cases instead of third person accounts. The object of this piece is to debate the question of whether the functioning of the courts must, whether administrative or judicial, be beyond the eye of the public. The present piece only seeks to stir debate on the issue of larger public scrutiny of the judiciary. The primary criticism of the presser by the senior judges seems to be the disdain of having brought the functioning of the judiciary on the street for all to see. But is that such a bad thing? The confidence of the people will not be hampered if the functioning of institution is in full public glare. In fact, the court process gets its legitimacy because of the fact that the proceedings of the court are open to one and all. The administration of justice is serious business – and the most important stake holders in this business are the people. And if these people have a right to know what their Justices are doing or not doing. There is a need for greater public scrutiny of the judicial organ – if not as much as the executive or the legislature, who face an election every five years, much more that what exists today. The scrutiny of the judicial organ, or the lack of it, is primarily a product of conservative thought, and the time has come for this thought to give way to reality. For, the judiciary is this branch which people most have reposed their faith in, and for it is this branch whose credibility one cannot fathom diminishing in a vibrant democratic system. By opening the doors to public scrutiny, the image of the judiciary would only enhance. Nobody will respect the judiciary any less. No harm would really be caused to the image of the institution. The presser by the senior judges must be looked at in this light. From functioning within an echo chamber, if the judiciary would be open for all to see, the administration of justice would have a new meaning and legitimacy. The American experience is only illustrative, and no radical disturbance of the status quo is advocated. But, a little sunlight hurts none. Amit A. Pai Is a Lawyer at Supreme Court Of India.